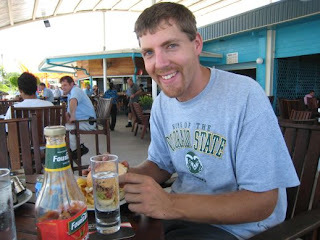 I am completely worn out from a quick trip to Lae with Brian. Lae is a big port city about three hours’ drive from where we live. Brian and I drove down yesterday, spent the night, and then came back this afternoon. If you want to snorkel and lay on the beach, you go to Madang. But if you want good shopping and good restaurants, you go to Lae. 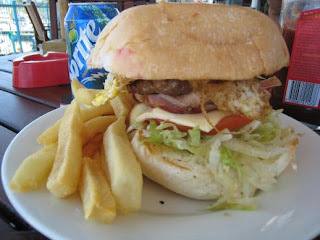 Here is a picture that is worth a thousand words – “the Lot” burger at the Lae Yacht Club. The actual burger is small and hidden in the enormous, delicious bun, but with all the lettuce, tomato, cheese, fried egg, bacon and beetroot, you don’t mind that so much. The Yacht Club offers a peaceful covered verandah to dine in, overlooking a muddy harbor and a small collection of very expensive boats. The food is great, but the price is even better – 14 kina ($4.80) for the burger, fries and a drink. Unless you’ve been living in PNG for at least 8 months like we have, I doubt you can fully grasp how wonderful this lunch was.